Do you have small items around your house that are broken, or need repair? Perhaps your favorite pair of jeans needs to be patched, or an old digital camera has salvageable parts? Don't just throw them out--let us help you figure out how to fix them! We'll have a sewing machine, electronics parts, jewelry parts, hand tools, and more on hand, as well as some inventive librarians who will be happy to investigate the more complex problems with you. Disclaimer: We'll do our best to help, but we cannot guarantee that your object will be fixed. Drop by anytime between 4 - 7:00 p.m. Attendance at this event is first come, first served. RSVP to receive an event reminder. 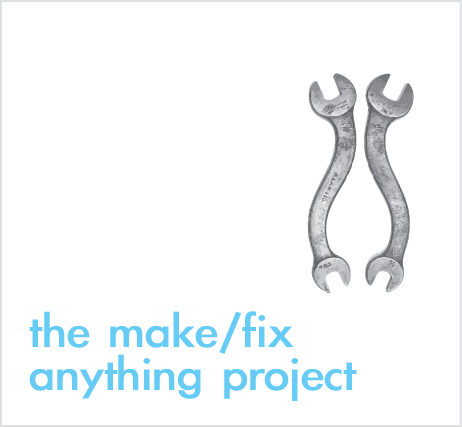 The Library is partnering with the The Make/Fix Anything Project, an ongoing practice about our ability to self-educate. More specifically it is an assertion that you can make or fix nearly anything. The make/fix anything project will help you and develop a living, learning community.